“Russia is halting World War III,” he said. And that’s exactly the message Russia’s largest television networks, all controlled by the Kremlin, are delivering. EDITOR’S NOTE: Right now, Vladimir Putin owns the Middle East narrative on a silver platter, and it is his to lose. The interesting thing will be to see what he does with it, and to how much of an extent Russia will partner with Iran. But far from ‘stopping WWIII’, Putin gives every indication that he just may have already started it. The video shown here of the airstrike received over 3 million views in the first 12 hours. 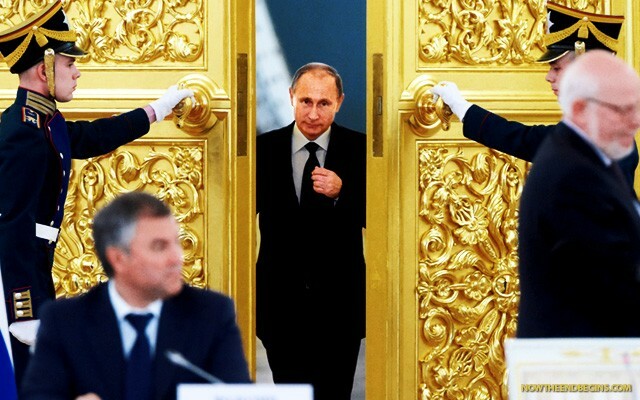 One thing is certain, Putin has a whole lot of new fans eager to see some action. Vladimir Putin may have caught the U.S. and its allies off guard by striking Syria, but his propaganda machine was ready. “A hundred dead terrorists,” a news presenter on Russia’s No. 2 network announced early Thursday, just hours after the bombing of what Putin has called “evil-doers” began. She then cut to a correspondent in Syria who lauded the precision of the strikes as aerial footage of the attacks supplied by the Defense Ministry aired. Over on Channel 1, the most-watched station, a parade of politicians, analysts and religious leaders — both Christian and Muslim — rolled by justifying the use of force on both legal and moral grounds. Even the leaders of the opposition parties in parliament, which is dominated by Putin’s United Russia, were brought in to explain why it’s better to fight terrorists over there than here at home. Someone, after all, has to clean up the mess the U.S. created in the Middle East, which threatens the fabric of civilization, Vladimir Zhirinovsky, the flamboyant head of the Liberal Democratic Party of Russia, told Channel 1.